Victoria Frank is the picture of teen perfection – she’s talented, witty, and ruthless – but being queen of tiny Geneva, NY isn’t enough. Tired of merely designing the perfect outfit, she sets out to design the perfect person. But by the time she realizes beauty is only skin deep, she’s already unleashed her monster on the world. Now it’s a race against time to stop the vile creature from destroying her life, and she has to do it in the most evil place of all – high school. After ditching her horrifying creation in L.A., all Victoria wants is the perfect senior year, but it becomes impossible when the dreaded beast shows up in her own backyard. Armed with a new body, a new attitude and a new name, M turns the school hierarchy on its head. But when M suffers the embarrassment of a lifetime and sets her sights on revenge, our queen bee finds herself pitted in a cat fight to the death where kid sisters, boyfriends and tiaras are all fair game. 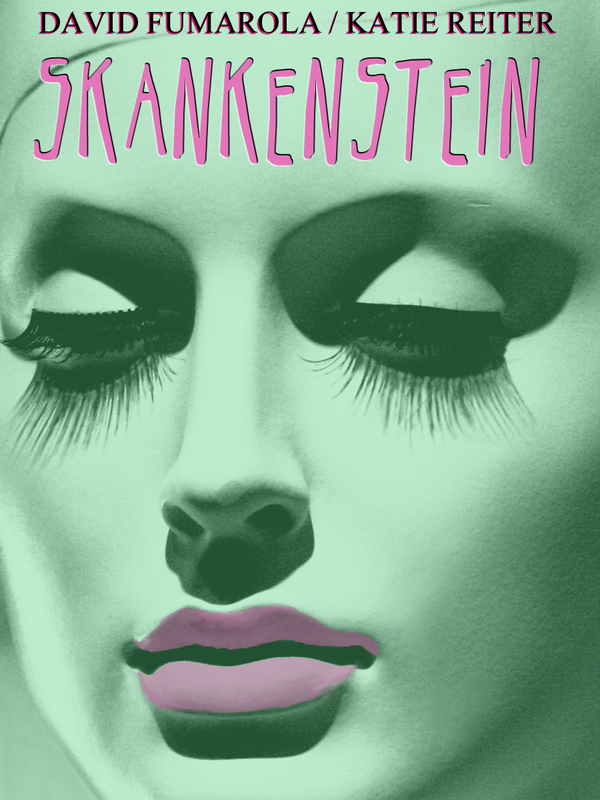 It’s a twist on Frankenstein unlike any before, with an ending so explosive it’ll leave your bowels quaking. David Fumarola has been writing as long as he can remember, and getting the stories out of his head and onto the page is the only thing that gives him peace of mind. Katie Reiter enjoys writing in her spare time, as well as cheap wine, teen drama and hipster safaris. They met as teenagers interning at the Albany Times Union and have been writing together since 2009. Skankenstein is their debut novel. Free Until May 21! Get It While You Can! She set down her burger, ketchup and onions spilling out where she had taken a bite. The greasy graveyard on her plate made me want to vomit. I had spent a good portion of my life avoiding crap like that. Not only was I trying to stay skinny, but that stuff goes straight to your complexion. I couldn’t keep my anger inside any longer. Still, I didn’t want to cause a big scene, even if we were in a trashy diner. I reached out and grabbed her plate, sliding it toward me. I grabbed the salt and twisted off the top. Then I flipped open the burger and dumped the contents of the entire jar onto the beef patty. I smiled and slid the plate back to her. “It made me feel better.” My smile turned into a grin. “You mean more than you already gave me,” she said, her eyes squinted in contempt. “Why?” I asked in disbelief. “What do you mean?” I asked as the waitress grabbed the plate. She made a face at us when she saw the salt covered food, but she didn’t say anything about it. “Yes,” I said quickly, shooing her away with my hand. “You sound like Dr. Kunst,” she said harshly. She gulped down the rest of her iced tea and then slammed the cup down on the table. Luckily it was plastic, so it didn’t break. “That’s exactly what I’m doing.” She smiled at me deviously. “Wow, that’s a pretty big word for a chick with a second grade education.” I rolled my eyes. The grumpy waitress brought the check to our table and walked away without saying a word. She didn’t go back to the counter. Instead, she went outside, and I could see her lighting a cigarette through the window. My stomach felt hollow. I was glad I hadn’t eaten anything; otherwise I might have thrown up. I was running out of options. I didn’t know what to do. The police weren’t going to believe me. There was nothing I could do to her without getting arrested myself. I had to just do what she wanted and hope she would go away. She turned and walked out of the diner. I grabbed the check and clenched it in my hand. I was sick of paying for her mistakes. Cover Reveal! Smash Into You by Shelly Crane!!!! !